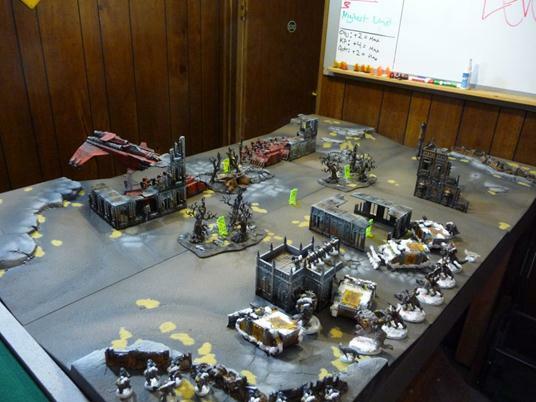 Narrative Battle Report #1: Blood Angels vs. Space Wolves. As the planet’s sun neared the horizon, large bonfires were already springing up at intervals within the Space Wolves’ encampment. The chapter provisioners had strategically placed casks of Fenrisian ale throughout the camp. Blood Claws and Grey Hunters had already tapped several of the kegs and the familiar smell of the rich and potent brew assailed Wolf Lord Thorgrim Oathspeaker’s sensitive nostrils. Somewhere nearby, someone was roasting grox meat and doing an excellent job of it, judging by the smell. Thorgrim’s mouth watered. But then Thorgrim’s acute senses detected a different odor. He looked for the source and soon, hearing raised voices coming from a pack of Grey Hunters, found it. 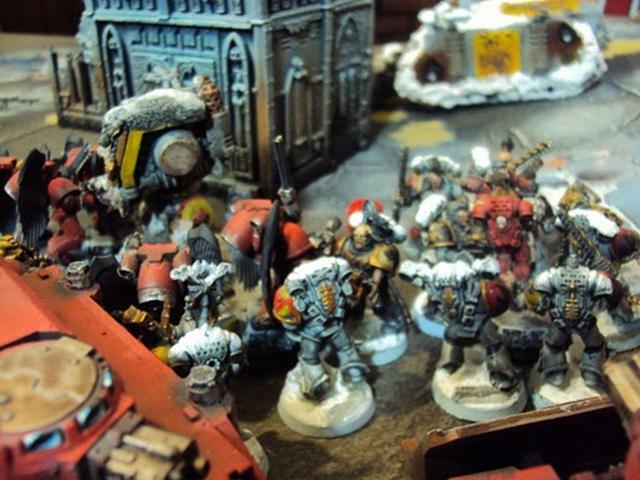 Standing among the Grey Hunters, his blood red armor almost glowing in contrast against the grey Wolves, was a lone Blood Angels Sergeant. His patrician features marred by a glowering scowl as he shouted at Loki, a young Grey Hunter who had recently been elevated from the ranks of the Blood Claws. The Grey Hunters were all shouting back and the entire proceeding was completely unintelligible. Thorgrim could smell the aggression and ale coming from his men. “Who are you? What is the matter here?” Thorgrim interceded, his imposing presence quieting the other marines. Thorgrim knew the Blood Angels to be volatile and the last thing either Chapter needed was a feud starting over something trivial. “I am Sergeant Vesalius. The matter here involves a sacred blood chalice. A chapter relic. This man, Loki, was the last to be seen near it,” the Blood Angel responded, his voice dripping with contempt. For a moment all that anyone could hear were the flames from the closest bonfire. Somewhere nearby a ceramic tankard broke. The sound echoed hollowly through the pregnant silence. It acted almost as a signal as several of the Grey Hunters growled and bared their fangs. Thorgrim knew that only his presence held back their aggression. Even he had balled his fists subconsciously in response to the Blood Angel’s taunt, despite his desire to avoid confrontation. “Sergeant, you had better leave before I slip my men from my grasp,” Thorgrim said, his voice steady, low, and full of menace. 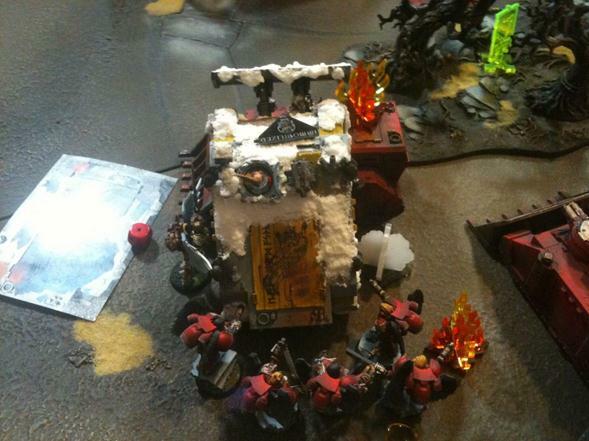 The Blood Angel stared at him coolly for a moment then turned on his heels and stormed back towards his Chapter’s camp. He was scarcely out of earshot when Loki started laughing. Thorgrim cut him off and knocking the young Wolf’s arms aside, reached into the satchel hanging from Loki’s belt and grasped what he had dreaded to find there. 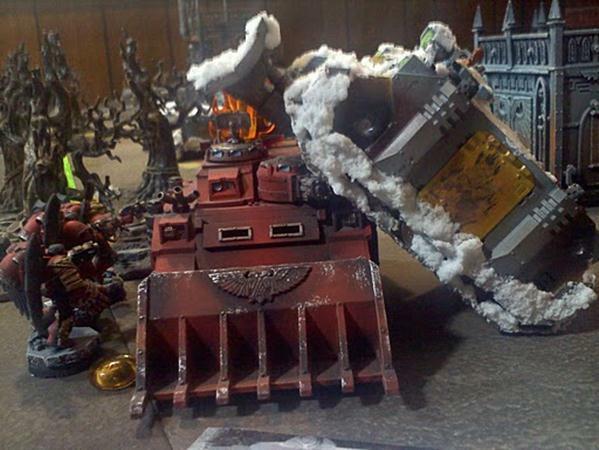 He pulled forth the Blood Angel’s sacred chalice, then backfisted the young wolf to the ground, the ceramite gauntlet easily splitting the young Grey Hunters lips in a spray of bright crimson. “Your ‘jest’ will cost this company much.” The incident had drawn a crowd by then and Thorgrim scanned the faces for someone able enough to accomplish a quick mission. His eyes found a Long Fangs’ sergeant, a longtime friend. He thrust the blood chalice into his hands. But Sven Olé had scarcely taken two steps when a sound like rolling thunder crackled through the dry air. “The sky is strangely clear for a storm,” a Grey Hunter remarked, his shaggy head scanning the heavens. 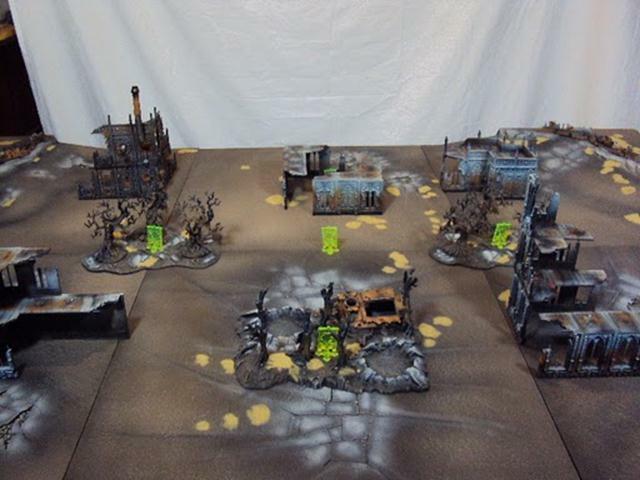 We were fighting this out on a nicely painted Realm of Battle Gameboard with some Citadel Woods and City Ruins Kenny had just painted for a client. The terrain looked fantastic and we both thought it would be a shame not to take it out for a dry run. Two large ruins and a forest graced the Blood Angels side of the table while three large ruins squatted on the Space Wolf side. Two forests split the table in the no man’s land. The five objectives were positioned with one in the center of the table and the other four at each point of the compass, 12 inches away from the center objective. Four hills were on each corner of the table with barricades positioned to provide cover. 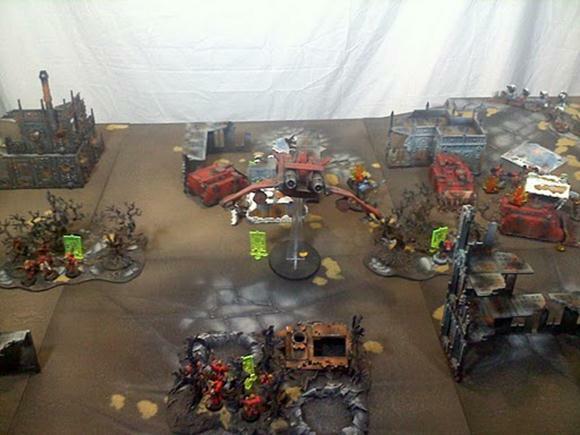 The Field, as viewed from the Blood Angel’s position. The Blood Angels won the dice off and opted to deploy first. 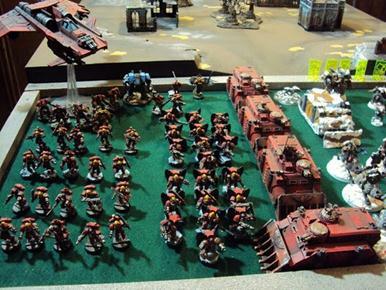 The Blood Angels’ strategy was to get into the Space Wolf lines as rapidly as they could and begin wreaking havoc as only the Blood Angels can. 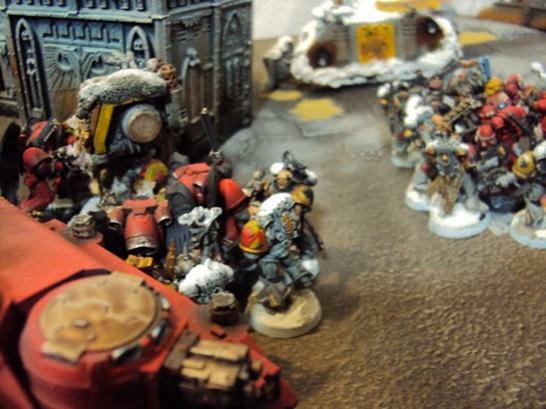 The Space Wolves, unable to match the Blood Angels’ speed, decided to play to their counter-assault strengths and let the Blood Angels break against their lines. 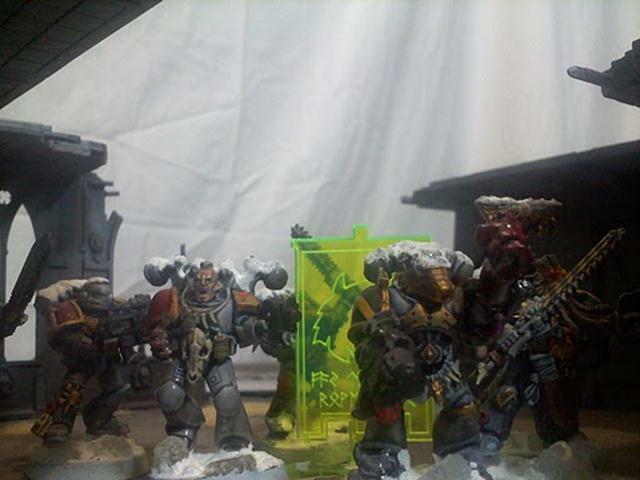 The Blood Angels deployed in a Rhino Wall screen behind cover to minimize risk in case the Space Wolves stole the initiative. 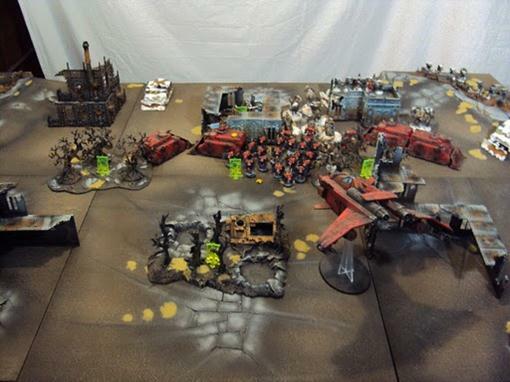 Both Assault Squads, Mephiston, and The Sanguinor deployed hidden behind the Rhinos and the Stormraven behind the taller ruin. Kenny rolled Blood Rage on both Assault Squads and one of the Squads in a Rhino. The Terminator Sergeant received the Sanguinary Blessing. 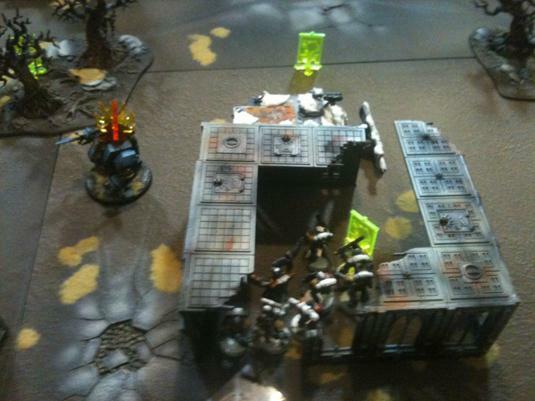 Mike’s Space Wolves deployed refusing their right flank with Rhino mounted Grey Hunters behind the ruins. He broke up the Wolf Guard so each Rhino squad was joined by a Wolf Guard as Pack Leader and the two Runepriests joined the two smaller Grey Hunter squads. Long Fangs deployed atop one of the ruins and on the hill behind some hastily erected barricades. The Thunderwolves with the attached Wolf Lords were spread along the back to react to either flank or charge the middle if necessary. Mike tried to steal the initiative without success. Wasting no time to deliberate, the Blood Angels charged. The Assault Troops’ jumppacks could scarcely be heard over the Rhinos’ supercharged engines as they raced across the no man’s land. The Rhinos’ smoke launchers hid the vehicles behind an effective screen. The Stormraven slashed across the sky using a massive burst of speed to bring its guns within range of the Space Wolf lines. Recognizing a target of opportunity, the Stormraven’s machine spirit fired the twin-linked multi-melta and one of the Space Wolf Rhinos became molten slag. The Grey Hunters within scrambling for cover. 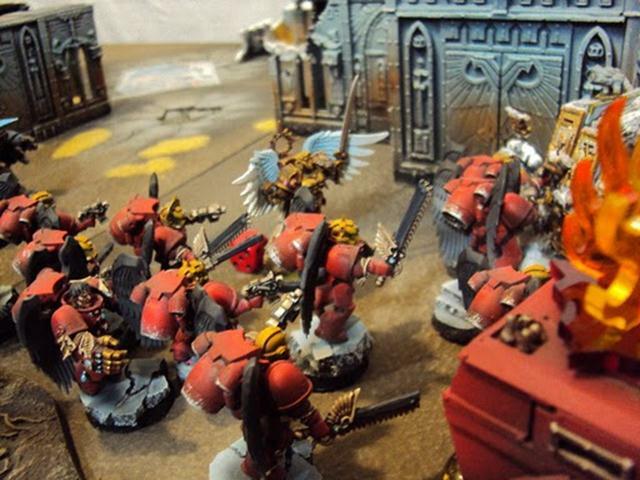 The Blood Angels, true to their name, had just drawn first blood! The Space Wolves had been expecting this. The Runepriest attempted to call the Tempest’s Wrath but the Furiouso Librarian was successfully able to break the Runepriest’s concentration. Lone Wolf, Olaf Sevenlives, charged into the ruin, there was glory and a bold Saga for the skalds to recount when he would meet those mounted within the Stormraven. The thunderwolves abandoned their plans to address one of the flanks and had to face the more immediate threat of what lay within the Stormraven. They had to bring it down and then they could feast on the bones of any survivors. The Long Fangs focused all their fire on the Stormraven and fired volley after volley, but so shrewdly did the Stormraven’s pilot do his duty, that not a single missile found its mark. As the Blood Angel’s craft drew nearer, the Grey Hunters brought meltaguns to bear, but the Stormraven dodged these nimbly. A howl of frustration went up from the Space Wolf lines. Finally, as the assault craft lowered its altitude to prepare for landing, Wolf Lord Thorgrim Oathspeaker lead the Thunderwolf cavalry in a bold assault. Urging his Thunderwolf to leap high, Thorgrim smashed his thunderhammer into the Stormraven’s assault cannon rendering it useless. 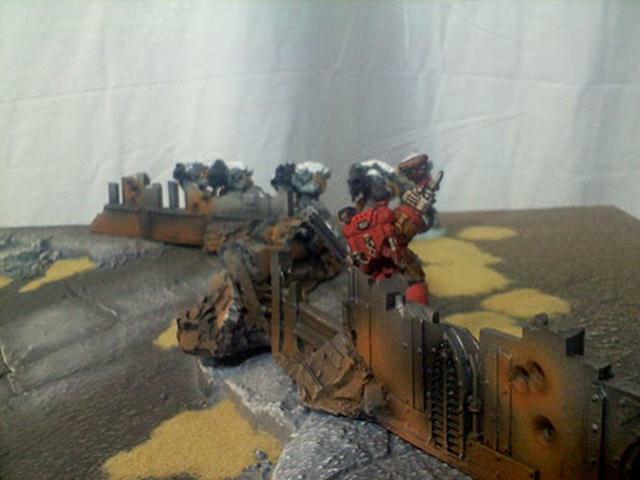 The assault ramp of the Stormraven dropped and the Blood Angel’s Terminator Assault Squad spilled forth led by their Sanguinary Priest. The Furiouso Librarian disengaged from the restraining clamps and smashed his way through the ruin walls to come face to face with the Grey Hunters who had just climbed free of their Rhino’s wreckage. 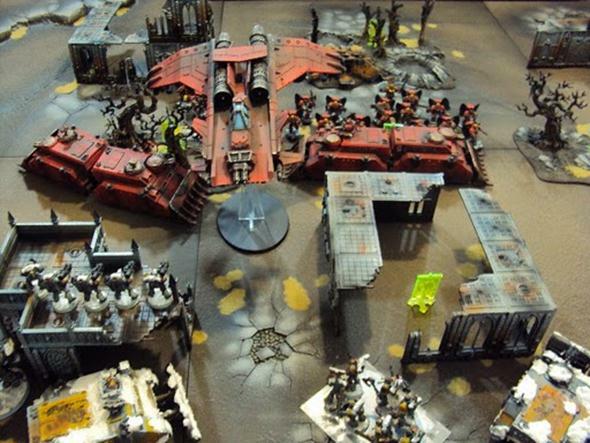 The Stormraven circled around to make another pass with its weapons while the assault troops activated their jumppacks and leapt over the Blood Angels Rhinos. They poured dozens of bolter rounds at the Thunderwolves, killed Thorgrim’s pet wolf, and managed to infuriate him further. 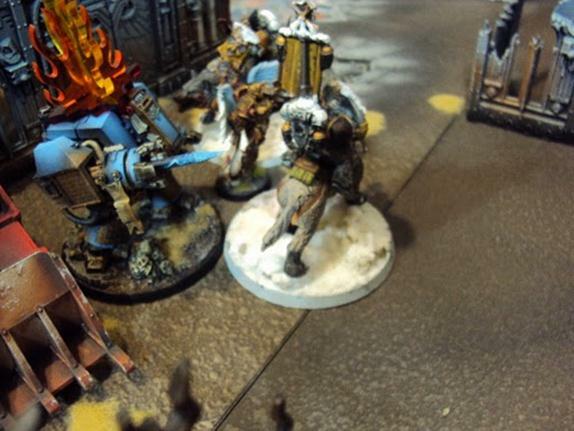 Meltaguns, firing from Rhino hatches reduced the Space Wolf’s dreadnought’s close combat arm to a mass of useless metal and succeeded in burning through Olaf Sevenlives’ armor. 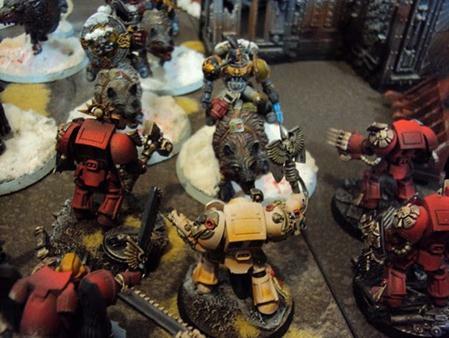 Seeing that the Thunderwolves were only irritated by the bolter fire, the Blood Angel Terminators, their weapons crackling with arcane energies, charged the beasts. The Priest fell locked in the jaws of a massive wolf. The Grey Hunters faced with the prospect of battling an irate Furioso Librarian fled the field after their attacks proved fruitless against the Dreadnought’s armored skin. Mephiston, the Lord of Death, met the closest squad of Long Fangs with an ill greeting which was not well-received. 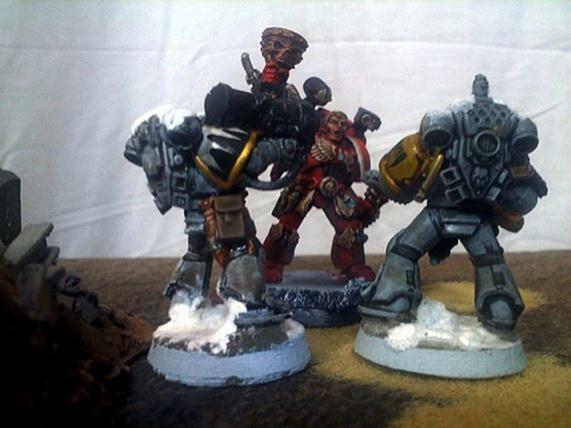 Olaf Sevenlives, Lone Wolf and last survivor of Nori’s company, met his end against the Sanguinor. Alas, not all sagas end in glory. 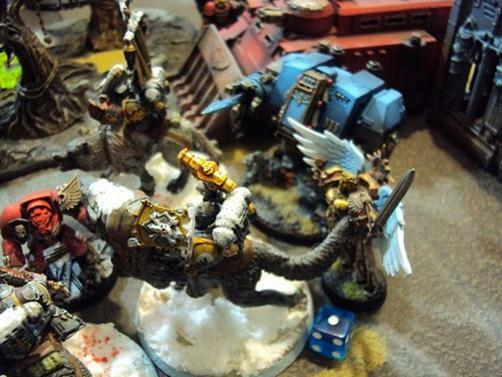 On the Space Wolves’ left flank, a Rhino maneuvered to cut off the Blood Angel’s Rhinos. The dreadnought stalked forth to assault the other Rhino. Missiles from the Long Fangs struck true, found the vehicles fuel tank and turned it into a rapidly expanding ball of flame and shrapnel. The Blood Angels within tumbled from the wreckage in a daze. The thunderwolves continued making short work of the terminators but the Majestic Lord Ulfwir the Bold fell to a Blood Angel’s thunderhammer. Driving through the other Rhino’s wreckage, the second Blood Angel’s rhino positioned itself to screen fire from the Long Fangs. Mephiston moved to assault a second group of Long Fangs. 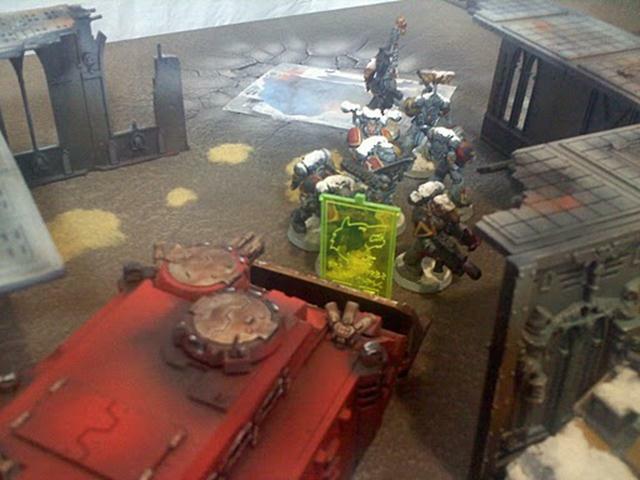 A squad of assault marines jetted to intercept the Space Wolf venerable dreadnought, struck the magazine of the assault cannon and vaporized it. The Stormraven flew in low and sent another Space Wolf Rhino to the halls of the machine god with a hail of Bloodstrike missiles. 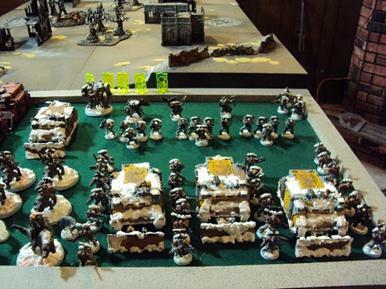 Mephiston sets his sights on another squad of luckless Long Fangs. The Rhino near the center melee maneuvered so the Sanguinary Priest within could more easily minister to the nearby troops. 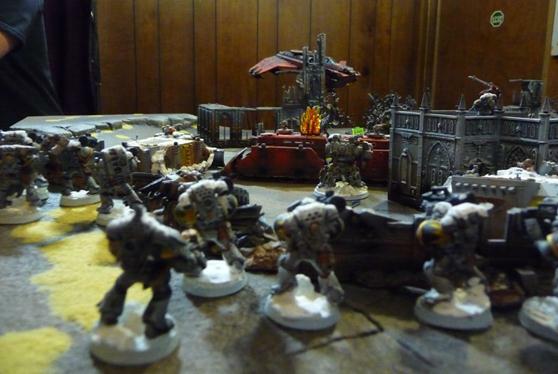 Meanwhile, the Furioso Librarian dreadnought and the Sanguinor bashed their way out of the ruins and sought to aid the lone remaining terminator who was facing three thunderwolf mounted Space Wolves by himself. 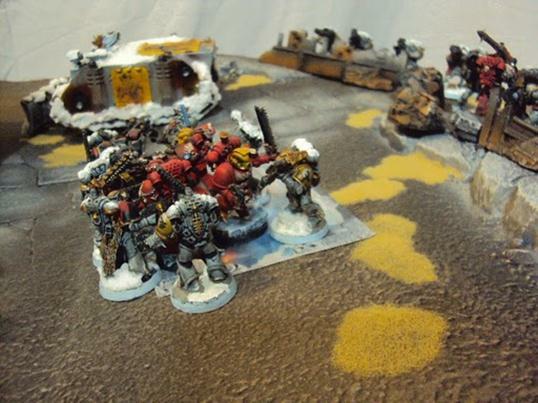 The Blood Angels from the wrecked Rhino assaulted the survivors of the Space Wolves’ exploded Rhino. Things were dire for the Wolves. But now both armies were fully engaged in the melee which is what they both loved. Grey Hunters on the left flank disembarked from their Rhino to attack the Blood Angel’s Rhino which was screening the assault squad from the long fangs. The Long Fangs fired a volley of missiles at it, but fearing they would strike their own men, they aimed too high, and the missiles went wide. The Venerable Dreadnought, a veteran of a thousand battles ignored the lack of weapons at his side and charged the assault squad, vowing to grind them to death beneath his feet rather than let them gain another inch of ground. 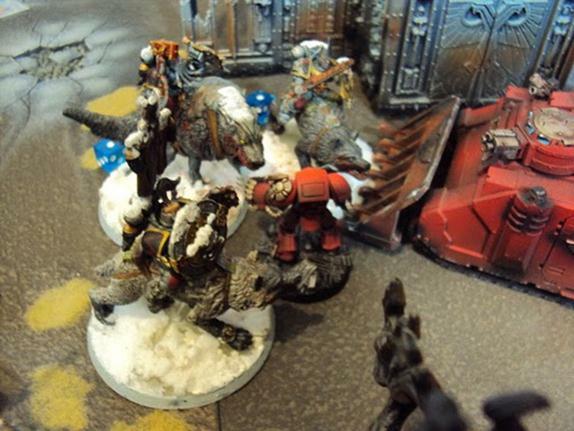 The Runepriest accompanying the dismounted Grey Hunters called forth the living lightning from the frigid air which immobilized the Blood Angel’s rhino and meltagun blasts from the pack’s specialist finished it off. 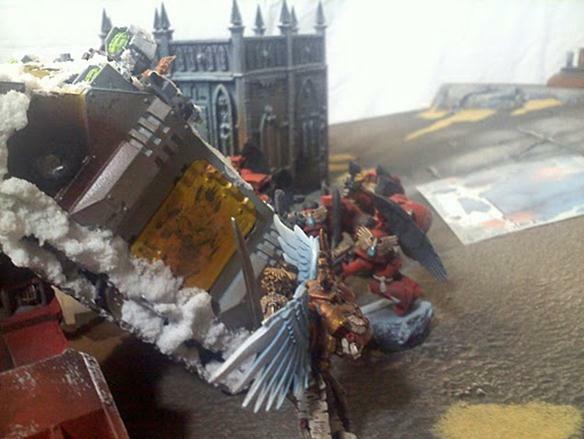 The explosion sent the surviving Blood Angels inside tumbling into the growling chainswords of the assaulting Grey Hunters. The Thunderwolves slew the last remaining terminator and a Thunderwolf-mounted sergeant’s powerfist sent the Furioso Librarian dreadnought back into a fitful sleep. All this, while the Sanguinor knocked Thorgrim Oathspeaker from his mount and dealt him a grievous wound which would keep him from the remainder of the battle. Brother Corbulo discharged his accompanying squad and commandeered their Rhino in order to race to the thick of the fighting. 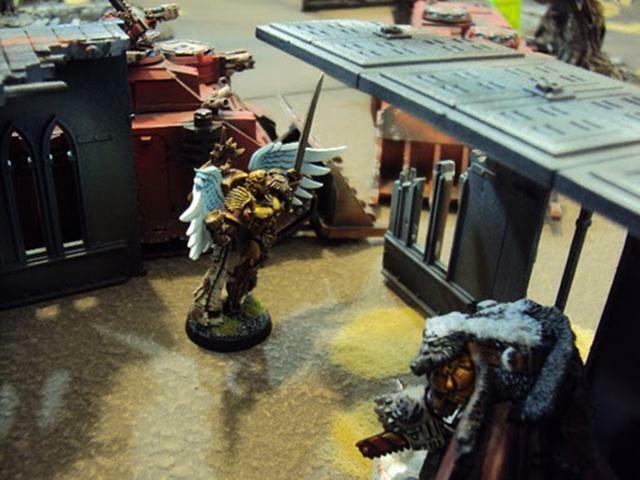 Mephiston, having recently dealt with the second squad of Long Fangs, leapt into the fray between the Blood Angels and Grey Hunters amidst the wreckage of the Blood Angels’ rhino. Responding to the vox calls of Corbulo’s former escorts, the Stormraven moved out to retrieve them so they could maneuver and secure some objectives. 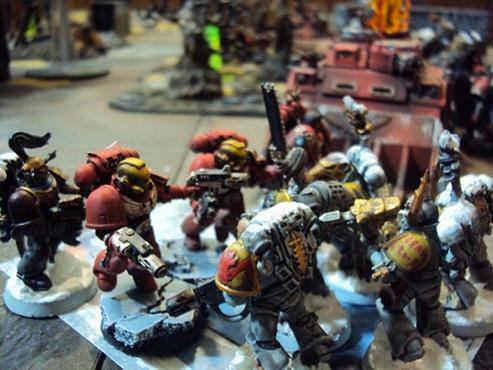 Seeing the Sanguinor engaged against two thunderwolf cavalry, the second assault squad revved their chainswords and joined the melee. Together they were able to bring the massive beasts and their riders down. Seeing the Stormraven peel away to retrieve another squad, the Long Fangs fired off another volley. The missiles flew true and would have surely destroyed the craft. But using his Far-Seeing Eye, Brother Corbulo had anticipated the attack. At the last second, he shouted a warning over the vox to the Stormraven pilot who managed to dodge the salvo of missiles. 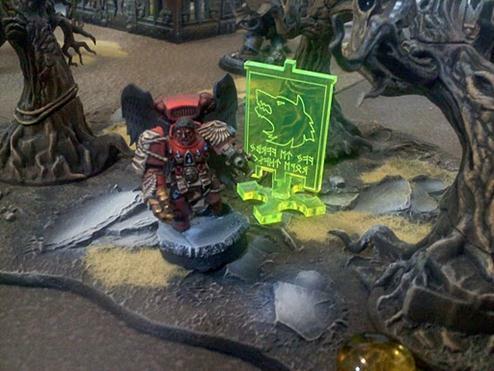 The second Runepriest braved the perils of the warp to summon the living lighting from the air once again, this time bringing its wrath upon the second assault squad. The Grey Hunters dealt Mephiston a grevious wound. They were dragging him from the field for ransom, when they stopped. 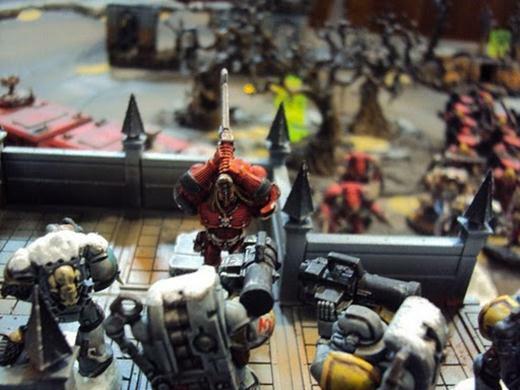 They could see the Sanguinor coming with the second assault squad. Having retrieved Corbulo’s escorts, the Stormraven moved off to secure an objective. 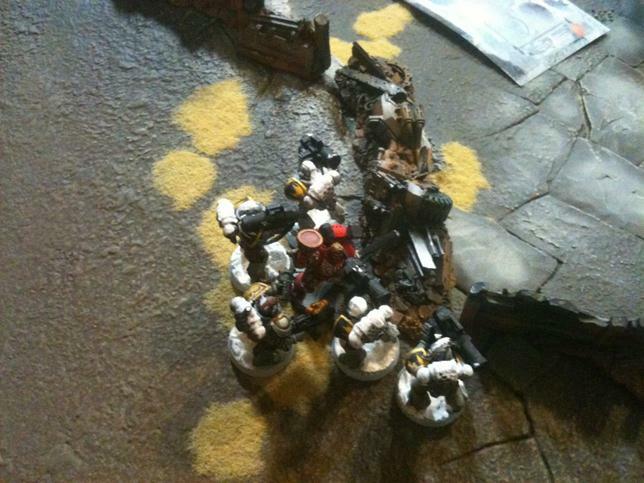 The remaining Blood Angels Rhino moved off to secure a second objective. 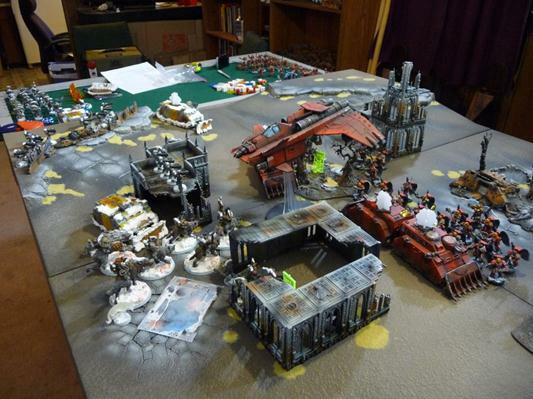 The Sanguinor and the assault squad nearest him continued their streak of victories by assaulting the venerable dreadnought and the remaining Grey Hunters. 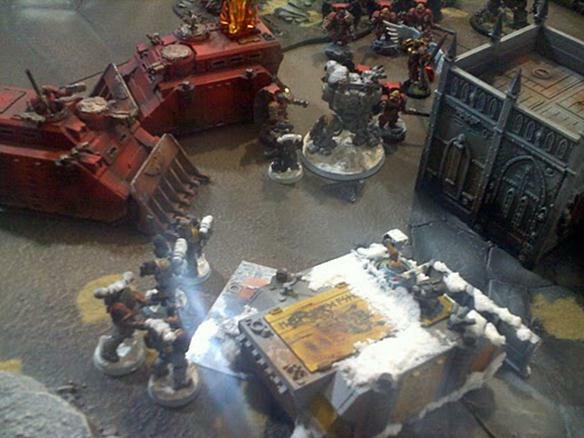 The Sanguinor cut the remaining space wolves to ribbons and a powerfist found one of the dreadnought’s critical systems detonating it in a massive explosion. 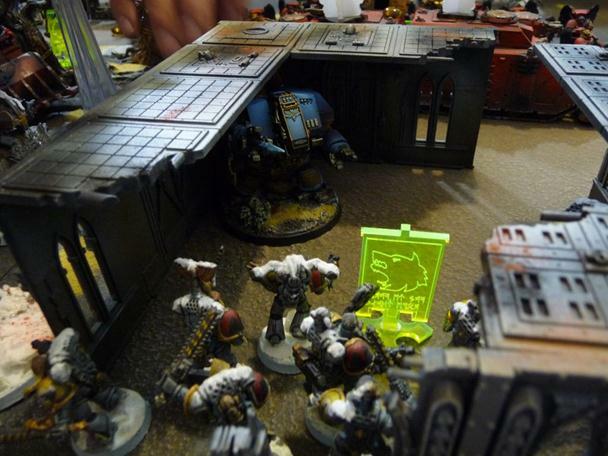 The remaining manned Space Wolves rhino gunned its engine then deposited the Grey Hunter passengers into the ruin to claim an objective. The Long Fangs fired another volley at the Stormraven, but the craft was moving so swiftly that all the missiles flew wide. The other Rhino bulldozered its way through wreckage in an attempt to contest the objective on the wolves’ left flank. 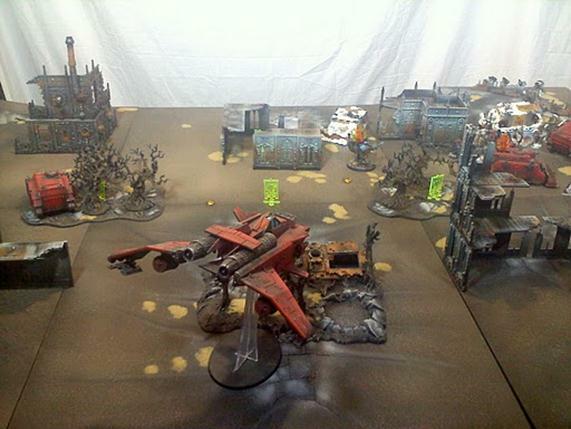 The Stormraven deposited its passengers then flew to the center of the field to contest the center objective. 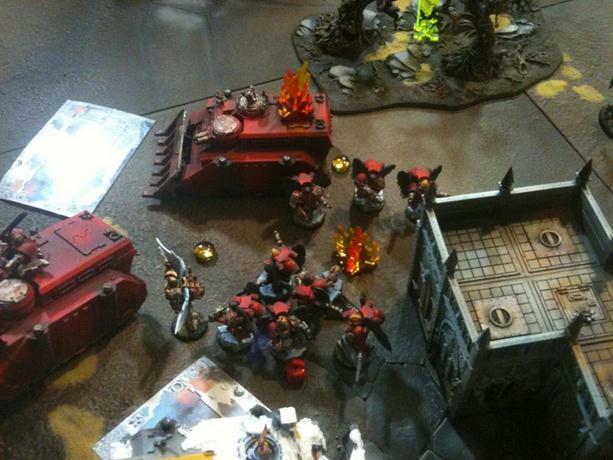 The remaining Blood Angels Rhino dropped off its cargo and then bulldozed its way through trees and into the ruined building to contest the objective held by the Grey Hunters. The survivors of the first assault squad moved into the forest to secure the objective there, while the second assault squad neutralized the Space Wolves’ rhino as it barreled its way through the wreckage. 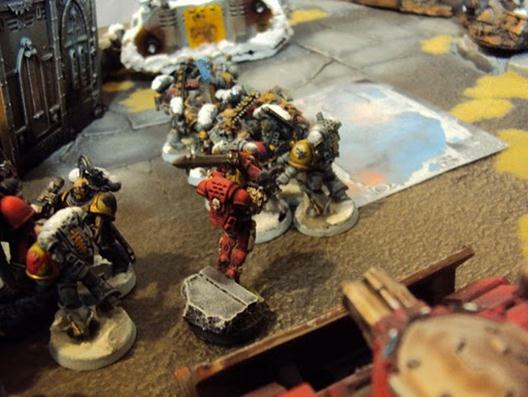 Brother Corbulo, catching sight of the sacred blood chalice in Long Fang Sergeant Sven Olé’s hand, moved to retrieve the sacred object from the Space Wolves. 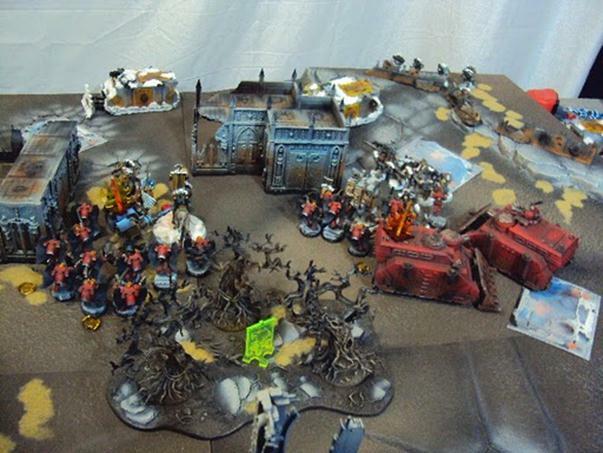 The Runepriest left his position within the ruin with the Grey Hunters so he could more easily call the living lightning down upon the two remaining Blood Angels claiming the objective on the Wolves’ left flank. Though he succeeded in calling down the lightning, it vanquished only one of the Blood Angels. The other, fearless in his determination, stood upon the objective his head held high in triumph. 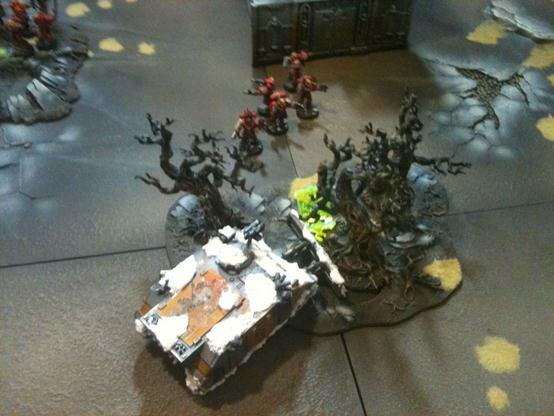 The remaining Space Wolves rhino lowered its dozer blade and crashed at full speed towards the second forest objective. 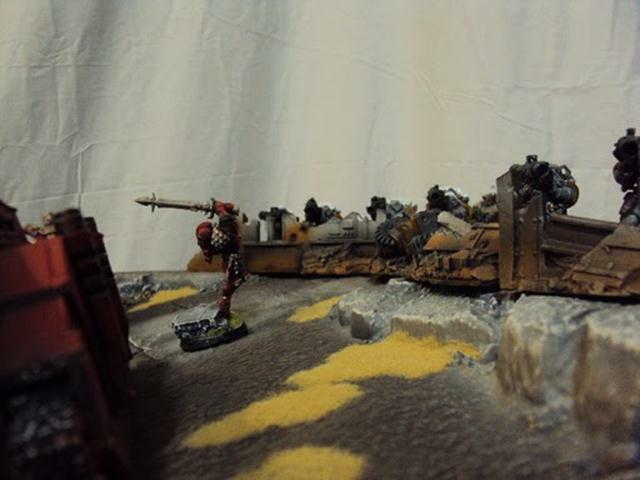 Thinking the driver insane, the Blood Angels dove from the path of the crazed vehicle, losing their grasp on the objective. The Grey Hunter specialist within the ruin brought his melta to bear. 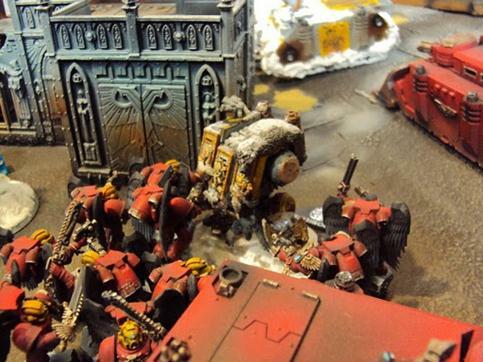 It drew a massive and thunderous explosion from the supercharged Blood Angels Rhino, and cleared any contention from their objective. On the far flank of the battle, nearly unnoticed by the participants of the fray, Sergeant Sven Olé returned the sacred blood chalice into the hands of Brother Corbulo who held it aloft for all to see. The latest misunderstanding between the two Astartes Chapters was at an end. At least for now. Kenny won the primary by holding one more objective than Mike did. And he received 10 points here. Kenny also won the secondary, by killing four more kill points. He received the maximum 10 points here. Kenny also won the tertiary by killing Mike’s highest point unit, Wolf Lord Thorgrim Oathspeaker, who weighs in at 285 points. Kenny’s highest point unit, the Sanguinor, was still alive at the end of the battle. 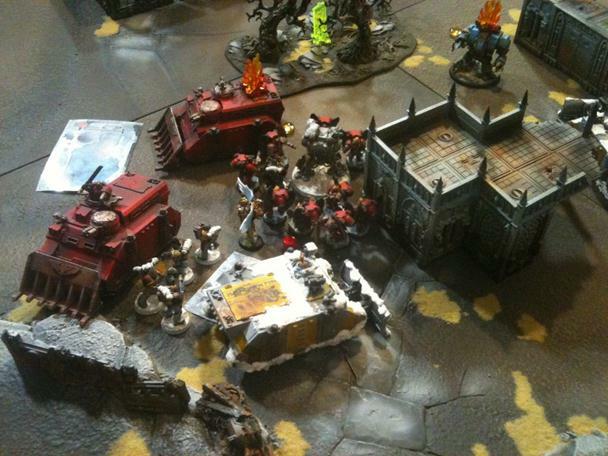 The Blood Angels leave the field victorious leaving the Space Wolves licking their wounds and yearning for a rematch. 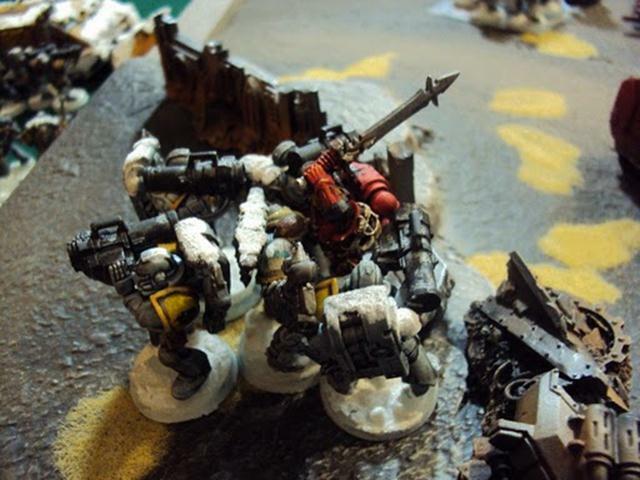 2 comments to Narrative Battle Report #1: Blood Angels vs. Space Wolves. Really loved the game! 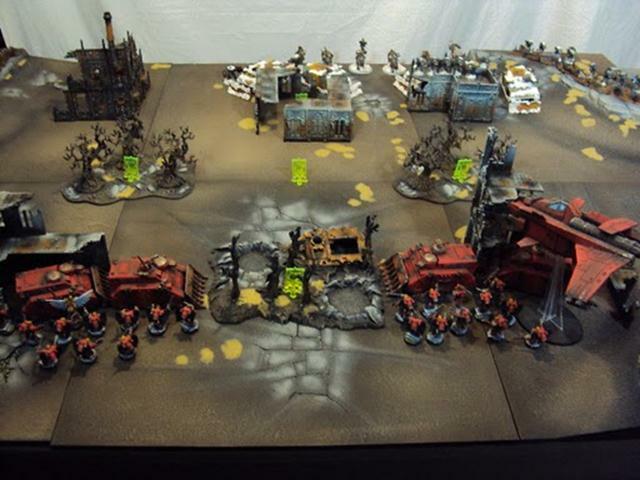 I also loved the list the Blood Angels player used, mostly because it was very similar to what I use. Great game, great photos, and the Narrative was nice too. Thanks. I’m glad you enjoyed it. 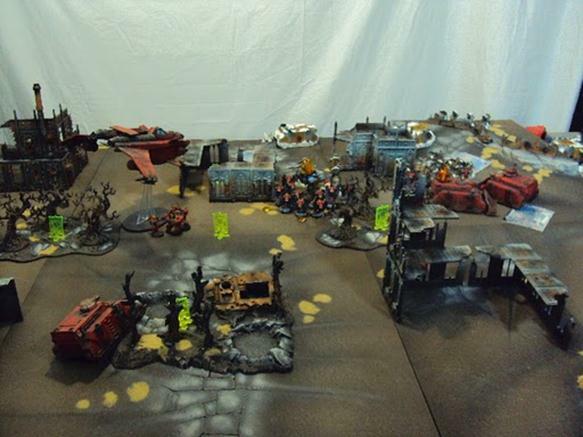 Once I get the site all migrated I hope to have the narrative battle report be a regular feature.